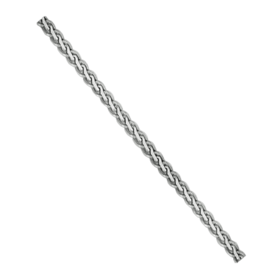 14k white gold diamond cut rope chain. This great chain is available in an incredibly large variety of widths and lengths. The rope chain is a nice sturdy chain, great for a pendant or just to wear alone. The diamond cutting gives this chain a lovely sparkle. Our price shown is for the 1.50mm chain with a lobster claw clasp in a 16 inch length and weighing about 3.49 grams. Available sizes include the 1.50mm up to a 3.1mm thickness version. Beautiful 14k white gold flat design wheat chain, also called a Spiga chain. This is a durable chain and is good for a pendant. We offer this white gold chain in the 1.8mm width and a variety of lengths. Our price shown is for the 16 inch length. This chain is secured with a lobster clasp.